One of our most popular pastimes in the American Midwest is hunting. Foster's School House is perfectly situated to give our guests access to ideal hunting grounds, including hunting on our own land in Crawford, Nebraska. If you're an experienced or beginning hunter looking for convenient and affordable lodging in the area, reach out to us by phone or email today to place your reservation. 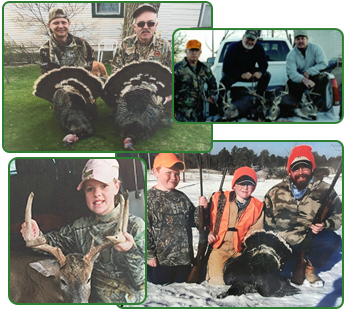 Our area offers some of the finest turkey hunting in Western Nebraska. Merriam turkeys are common in the area, and are some of the largest and most exciting to hunt. There is no greater thrill than seeing a big tom gobbling and strutting in our pine covered canyons. You can choose between the fall and spring seasons to hunt. Whether you are looking for whitetail or mule deer, Crawford, Nebraska, and the nearby areas is a great choice for a hunting trip. The area has been known to provide some of the best hunting in the Panhandle of Nebraska. Place your tree stand in a large pine or sit on a high ridge overlooking the pine covered canyons. We offer hunting on private land or public hunting areas. You can choose either archery or rifle hunt.